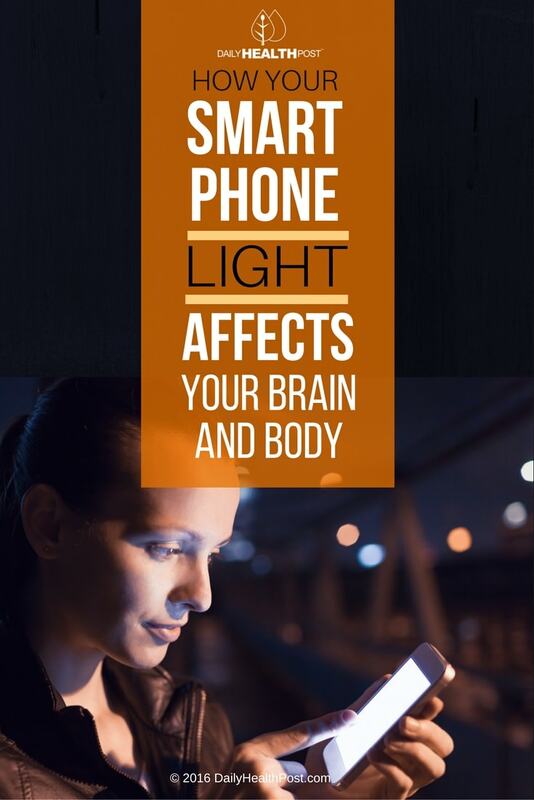 Your smartphone screen produces a blue light to make it easy to use in bright and dark environments. However, at night, exposure to this light suppresses your pineal gland’s production of melatonin, a sleep hormone. That’s because this gland is typically stimulated by darkness thanks to signals from a photoreceptor known as Melanopsin, located in the retina ganglion cells. When your eyes focus on bright light long after the sun goes down, the photoreceptor sends mixed signals (1). This hormone regulates your sleep cycle, making it more difficult for you to fall asleep and get an uninterrupted 7-9 hours. In turn, you’re less likely to get all the REM sleep you need. And since REM sleep is essential to repair and restore your cells, the result is increased fatigue and a higher risk of disease. Sleep experts recommend that you do not use any electronic devices a few hours before going to sleep. These includes cellphones, televisions, computers, or tablets (2). While some phones have the option of using a red filter on their screens past a certain hour to boost your melatonin levels, it’s better to shut off your device completely (3). Office workers and tech-savvy teens are at the highest risk of device-induced sleep disorders. Teenagers need about 8-10 hours of sleep a night, but the National Sleep Foundation writes that a study found that only 15% teenagers reported sleeping 8 1/2 hours on school nights. Unhealthy habits like staying up late and sleeping in on weekends don’t help either. 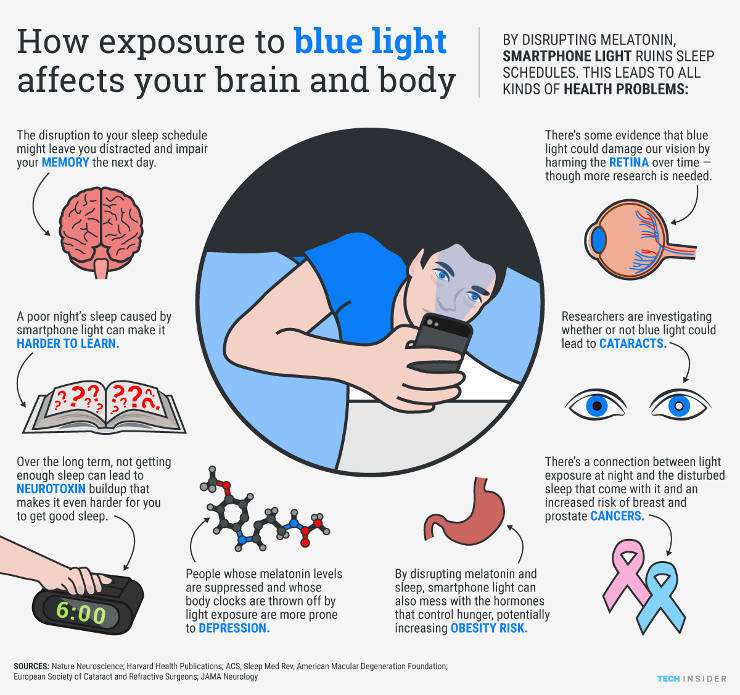 Since teenagers already have a hard time getting enough sleep, they can be particularly sensitive to the effects of blue light (4). Alarmed at the effects of smartphone and tablet use, Dr. Martin Blank, from the Department of Physiology and Cellular Biophysics Columbia University, gathered a team to discuss the risks of cell phones and wireless devices with the United Nations. They mentioned, among other things, that wireless devices emit radiation that can cause tumors and cancer over time. These devices can also cause addiction in young children (5). Here is an infographic that shows just how harmful these technologies really are. Despite all these studies, smartphones and tablets are at the foundation of how society works today. 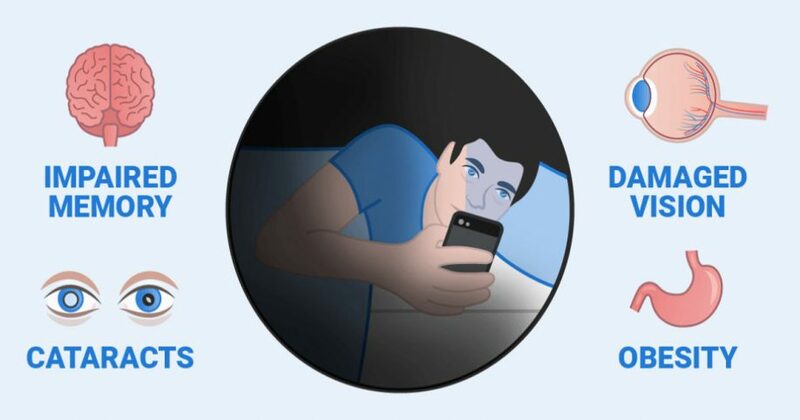 As the night goes on, reduce your use of electronic devices and shut them off completely about 2 hours before bed. Wind down by doing chores, practicing yoga, taking a bath, or reading before going to sleep. Download a red-filter app or change your phone’s settings to lower the brightness of your screen in the early evening. Keep all electrical devices out of the bedroom to avoid radiation exposure while you sleep.